Writings, sermons, images, and other odds and ends from my efforts at finding and naming Peace in the in the midst of the storms of this world. By immediately jumping to what happened next – the moment of doubt followed by sinking – I think we often forget just how amazing it is what Peter did—and what it means for us today. Despite years working in and around the water having given Peter ample experience as to what happens when a human being steps out of a boat onto the water in the midst of a storm, Peter steps out and starts walking to Jesus. Empowered by his willingness to answer Jesus’s invitation, Peter leaves behind the only safety and security that he has ever known on rough waters – the confines of the boat – the place that all the world would tell him is the only place where he can possibly survive. But Peter has begun to trust in a deeper truth—in a deeper reality—in a more powerful protection. Peter steps out in faith that the one before him, Jesus of Nazareth, can empower Peter to do the very miracles that Jesus does. He steps out not merely believing in the power of Jesus do to wonders—but also in faith that Jesus is giving his followers the power to do wonders in his name. It must have been an extraordinary moment. Peter accepts Jesus’s invitation to be more than Peter could have ever imagined – to be a person who walks on water – to channel the power of God through his being. In that moment, Peter became an enduring witness to the world-altering power of Love. But, then, Peter was startled by the strengthening wind—doubt crept in—and Peter quickly retreats to the restrictions that the world had always put upon him. He retreats to the limited vision of his own humanity that he had known before he ever encountered Jesus. And, as his vision diminished and the power that he was channeling began to dissipate, his feet grew heavier, and the water began to drag him down. Nonetheless, even as he felt himself sinking, Peter did not try to save himself nor did he resign himself to the depths. 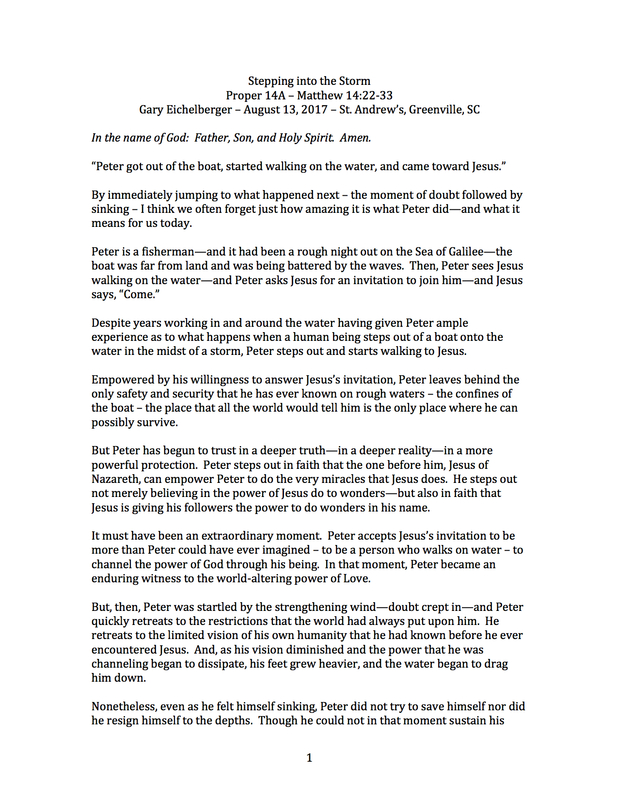 Though he could not in that moment sustain his faith in Jesus’s ability to work through him, Peter still believed that Jesus had the power to save him. So Peter cried out, “Lord, save me!” Peter still had faith – faith in the one who invited him out on to the water – faith in the one standing atop the waves. And Peter’s faith was rewarded. Jesus reached out his hand and caught Peter. Jesus lets Peter know that, in his brief stroll upon the whitecaps, Peter has only begun to tap the potential that he has as a witness to the world-altering power of love. There is so much more that Peter can – and will – do in the name of Jesus. I don’t know if you have ever seen an Episcopalian walk on water as a testimony to the world-altering power of love. I certainly haven’t. But, yesterday, I saw something just as powerful. I saw video and images of Episcopal bishops and priests and laypeople – along with clergy of many other denominations, people of many walks of life and backgrounds – stepping out in faith and love onto the unfriendly waters stirred up by the evil storms of hatred, racism, and violence that swept through Charlottesville, Virginia, yesterday. Perhaps you saw some of the same images. In particular, there was the powerful video of numerous clergy on their knees forming a human wall with their arms linked singing the gospel song, “This Little Light of Mine,” opposite a line of heavily armed white supremacists. The contrast could not have been starker. On one side was a homogenous group of white men apparently united by their faith in automatic weapons, body armor, and violent hate-filled ideology. On the other side were men and women, of a variety of skin colors, some in shorts and t-shirts and others in clerical garbs of various traditions—all united by their faith in the power of unarmed love to overcome militant hate. Those faithful individuals in Charlottesville yesterday were, like Peter, walking on the water in the face of the violent storm that surrounded them. They were testifying to the world-altering power of love. And it was an extraordinary thing to see. Of course, the beauty of those moments was ultimately shaken by the tragedy of the terrorist act that followed later in the day yesterday—as another hate-inspired man – this one armed with a motor vehicle – lashed out in violence taking the life of one young woman and injuring close to twenty others. Just as the wind startled Peter into fear for his own safety—into doubting the power that was being channeled through him, I imagine that there were many in that crowd yesterday who felt a similar fear when the reality of the power of destructive violence struck – perhaps some of them had been seen kneeling in courageous solidarity in the midst of the rough waves earlier in the day. But, even if they faltered momentarily, love did not abandon them on the rough water yesterday. Just as love did not abandon Peter. All of those who gathered in love were held by love—all of them. As was dramatically demonstrated by the events of yesterday in Charlottesville—events that are in continuity with a long troubled history that is still far from being overcome—the storms of racism and hatred cannot be dismissed as a thing of the past but, rather, we are living through at time when the storms are gathering strength. And love calls us out into those storms. As we find inspiration in the account of Peter’s boldness in the midst of the storm then – as well as in the boldness of those who stood and kneeled as a nonviolent resistance in Charlottesville yesterday – our calling is to challenge the sinful waves of hatred and evil – and to challenge them not merely from within the safe confines of the boat—though here in the boat is an important place to start. Like Peter, our calling is to step out into the rough waves of this world, trusting that our Lord will empower us with the world-altering power of love that we might walk in peace amidst the rough waters. That we might provide a witness that boldly speaks the truth to evil in our midst. That, trusting in his power, we might likewise do wonders in his name. I preached this homily on June 21, 2015, just three days after the massacre at Mother Emanuel AME Church in Charleston, South Carolina, where nine of our brothers and sisters in Christ were martyred as they welcomed a stranger into their midst as they engaged in bible study.